To establish a limited liability company (LLC) in the state of Tennessee, you must file an application with the offices of the secretary of state. In most cases the document to be filed is the application for certificate of authority (SS-4423). Once this has been processed and taken effect, you must complete form SS-4232. When you do this or at a later date, you may wish to also file an application to register a name for your business. This form is SS-44402. 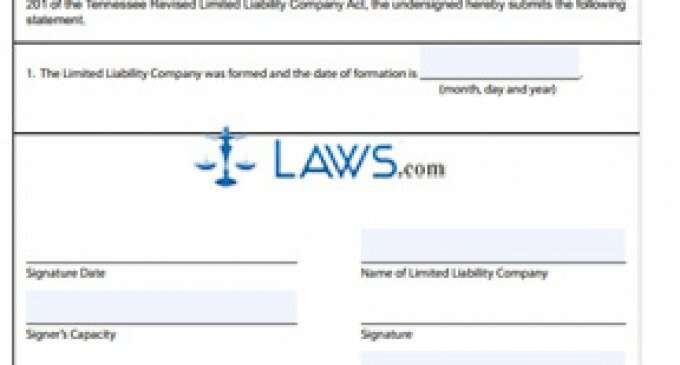 This article discusses the document which is a certificate of formation confirming that this LLC has been established. The document can be found on the website of the Tennessee Department of State. Tennessee Certificate Of Formation (Limited Liability Company) SS-4232 Step 1: Do not write anything in the section labeled "For office use only" at the top right corner. Tennessee Certificate Of Formation (Limited Liability Company) SS-4232 Step 2: The only question to be answered is in the middle of the page. In this section, enter the day, month and year on which the LLC in question was formed. Tennessee Certificate Of Formation (Limited Liability Company) SS-4232 Step 3: Give the date of your signature where indicated. 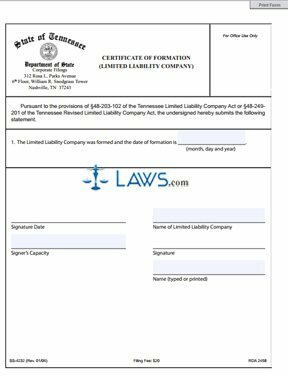 Tennessee Certificate Of Formation (Limited Liability Company) SS-4232 Step 4: Give the name of the limited liability company where indicated. Tennessee Certificate Of Formation (Limited Liability Company) SS-4232 Step 5: Give the capacity within the LLC of the person completing this form where indicated. Tennessee Certificate Of Formation (Limited Liability Company) SS-4232 Step 6: Give your signature where indicated. Tennessee Certificate Of Formation (Limited Liability Company) SS-4232 Step 7: Type or print your name where indicated. You do not need to be in the presence of a notary public for this document to take effect. Tennessee Certificate Of Formation (Limited Liability Company) SS-4232 Step 8: Submit this document to the Tennessee Department of State. Tennessee Certificate Of Formation (Limited Liability Company) SS-4232 Step 9: Along with this form, you must submit a $20 filing fee. Tennessee Certificate Of Formation (Limited Liability Company) SS-4232 Step 10: At a later date, you may wish to dissolve this company. To do so, you will need to submit a form for a certificate of cancellation of authority. This form is SS-4241.